We’re at a moment of profound transition and successive crisis for news. Our mission is to explore how membership models might help. A key takeaway from our research over the past 12 months is that membership models are fundamentally different from subscription or product models--and that they require whole new methods and mindsets to be successful. Today we launch new research with the Knight Center for Journalism in the Americas at the University of Texas at Austin with clues for news. Spanish and Portuguese versions are coming soon. An executive summary is below, and you can read the full report in English here. Membership isn’t just “subscription by another name” (though it’s often referenced that way), or about giving consumers access to a product. It’s participation in a larger cause that reflects what they want to see in civil society. In membership, there’s a different social contract or value proposition between the site and its members. At the basic level of: What do you give? What do you get? Subscribers pay their money and get access to a product. But members join the cause and participate because they believe in it. What can news membership programs learn from other spaces? The news industry isn’t the first to wrestle with these questions. Other spaces have been experimenting with forms of membership and belonging, sometimes for thousands of years. Others are engaging their members to do everything from build open source software for automobiles to build jumbo jet disco camps in the desert. The question for our team of freelance researchers around the world was: what clues might we glean from other membership veterans and pioneers? How are they tackling their own membership puzzles? And how might news organizations emulate some of those techniques, be inspired by their thinking, and/or learn from their examples to bolster membership models for news? 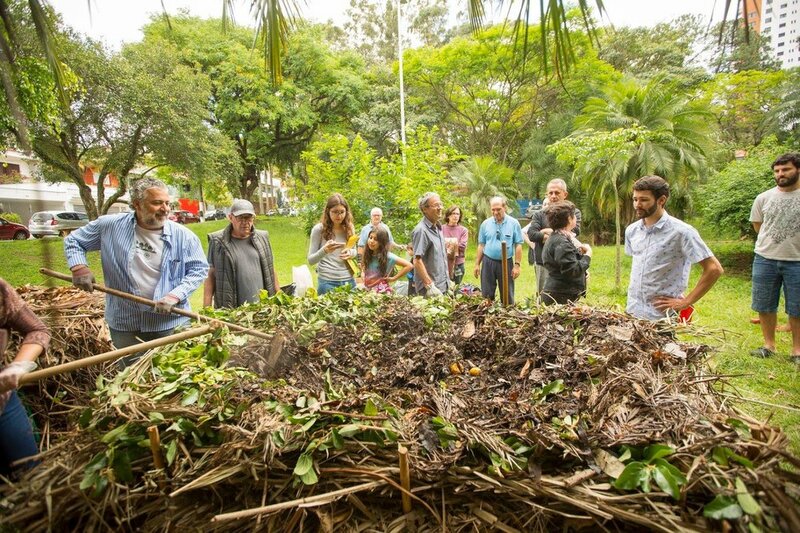 Working towards a more sustainable neighborhood, together: members of Ecobairros, a community-led volunteer group in São Paulo, Brazil, joined forces to revitalize neighborhood springs during the city’s worst water crisis in decades. Motivation — What motivates people to join? What membership value propositions stand out in contrast to present social, political, and financial events that prompt common feelings that “something feels broken”? Is there a secret sauce? A magnet? What larger forces or feelings are driving people to seek out membership in new ways right now? Participation — What do members do? Beyond plonking down their hard-earned cash, how can individuals contribute time and expertise in ways that are mutually useful? What are the most innovative member-driven organizations asking their members to do — and how does that strengthen member engagement, retention, and loyalty? Scale — How do successful member-driven movements grow? How do they stretch limited marketing budgets and cultivate word of mouth? How do they recruit new members and scale up while staying healthy and not diluting what attracted people in the first place? There is deep value in listening, testing, and being fascinated with what members value. This is a mindset shift. Instead of just assuming what members want, successful membership organizations have developed ways of listening, fresh thinking about what their members actually want, and strong feedback loops to get it right. They’re empathetic and open to learning. They frequently adopt more agile approaches than they may have used to in the past. Inspiring membership-driven organizations connect individuals’ passions to a shared larger purpose. They sell more than a product or a cause. Successful membership organizations recognize and celebrate the individual while making them feel connected to something bigger than themselves. They get the ratio right between the individual and the group. This is neither a product pitch (“get 20% off exclusive content!”) nor a traditional “cause” (“save the whales!”). Instead, it’s a unique cocktail or hybrid of both. Getting that ratio or recipe right (which is hard because it often defies typical marketing approaches or advice) feels like a secret sauce for many of the successful movements we looked at, in terms of how they think about the member mission, “social contract,” and pitch. This goes beyond offering plentiful member perks and relies on studying members’ intrinsic and extrinsic motivations. Membership is one way to restore what feels broken. Many people told our team that they join as members because they feel something fundamental in the world and/or in themselves is broken. In membership they seek a way to feel part of a solution. Successful membership programs don’t shy away from connecting to the larger state of the world. They connect to the present zeitgeist in which something crucial is broken or out of balance — and then offer membership as credible grounds for optimism. Offer flexible means of participation. The organizations we studied are attuned to people’s abilities, goals, limitations, and lifestyles. There is a whole range of ways for their supporters to participate in ways that are designed to maximize their time and effort. Grow at human scale. Unlike more transactional models (including subscription), membership cannot scale beyond an organization’s ability to serve its members. In some cases we see organizations strategically limiting their growth to support members and ensure member value is not diluted. We think this has important ramifications for restoring the “human element” to news. You can read the full report here. We’re deeply appreciative to the team at the Knight Center, including Mallary Tenore and Rosental Alves, for the opportunity to collaborate. 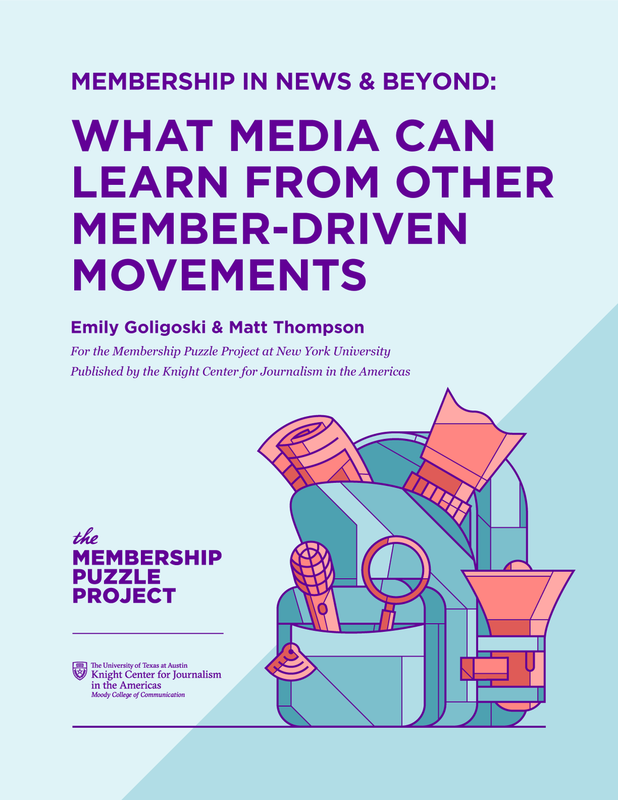 This research builds on work by Ruth Tupe for the Membership Puzzle Project, and you can see us talk about it as a team too. We look forward to your thoughts on other spaces we should explore. Special thanks to Matt Thompson, Mallary Tenore, and Lukas Kouwets.